Welcome back to our blog! There are many general health benefits that you may gain from walking, but did you know that walking can improve the health of your spine? In today’s blog post, we will take a look at how walking on a regular basis can enhance your posture, encourage circulation, and stimulate a healthier functioning of the central nervous system to improve your overall health and wellness, and relieve pain. Please continue reading below to learn more. Whether you have gained a few pounds during winter or struggle with obesity on a daily basis, carrying around excess weight shifts your balance, which affects the health of your spine. For instance, when you carry extra weight around your midsection, not only is additional pressure placed on the lower back and hips, this excess weight throws your balance off by pulling your body forward, affecting the natural curvature of your spine. Walking three to five days a week for 20 minutes or more, and gradually increasing your walk frequency and duration, can help you manage your weight which can help keep your spine in better alignment. In order for your central nervous system (spinal column and brain) to function properly, healthy circulation is essential. Walking gets your heart and blood pumping, stimulating overall circulation to replenish the soft tissues, spine, and organs with nutrients that support your health and wellness. When your muscles, joints, and other tissues receive the nutrients they need, they can function better, allowing for better range of motion, flexibility, and movement. Along with helping to manage your weight, walking strengthens your bones, muscles, joints, and other tissues that support your spine. Walking also strengthens the hard and soft tissues in your torso, hips, legs, and feet, making them healthier and stronger support systems for your spine and posture. Walking releases the body’s natural pain relieving chemicals called endorphins, which can alleviate back pain. 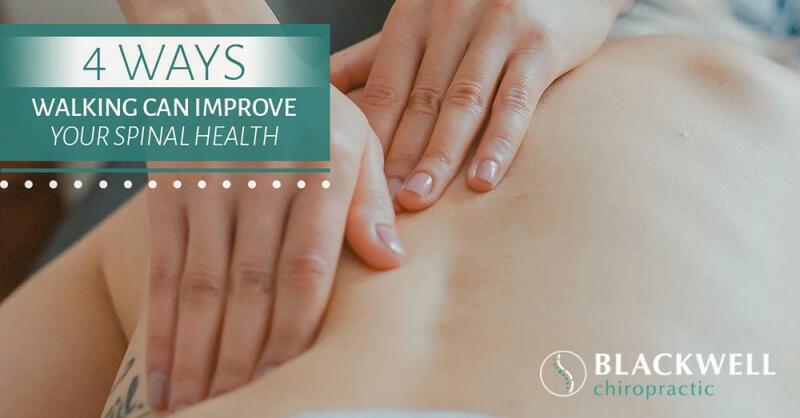 Additionally, circulation helps cleanse the body of toxins while restoring injured tissues with vital nutrients to aid in the body’s natural ability to ease pain and heal from an injury. Walking is a wonderful way to care for your spine at home, which can enhance the chiropractic treatments you receive with us at Blackwell Chiropractic. Call our Top Rated Local® chiropractor in Dallas today to schedule wellness care or alleviate back pain. You chiropractor can discuss the benefits of walking for your spinal health during your visit, so come in and see us today!